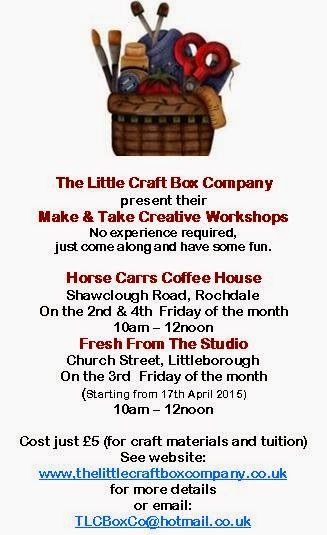 The Little Craft Box Company: Make & Take is coming to Littleborough!!! Make & Take is coming to Littleborough!!! From the 17th April, I will be holding my, Make & Take Creative Workshops at Fresh From The Studio, Church Street, Littleborough on the 3rd Friday of each month from 10am -12noon. The cost is just £5 which includes all craft materials and tuition. Places are limited to 8, so get there early to avoid disappointment. Horse Carrs Coffee House, Shawclough Road, Rochdale from 10am - 12noon.